Since I don't enjoy knitting with yarn that knits up variegated, I have no idea why I bought a ball of yarn that looks like it's totally going to knit up variegated. 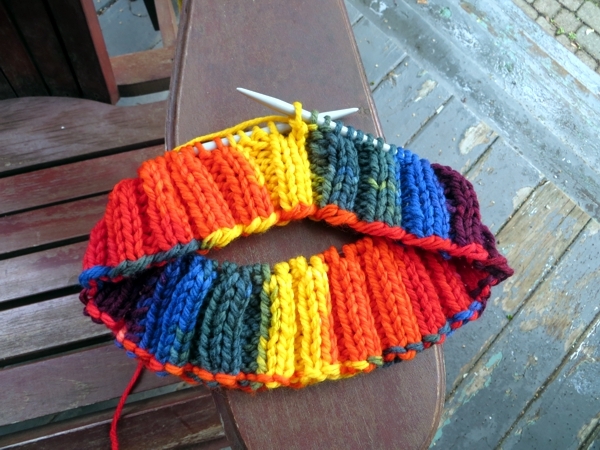 Fortunately, what I am knitting with it needs to be more or less 2x2 ribbing rather than a stitch-perfect award winner, so I got the bright idea to knit it up in vertical stripes whether it likes it or not. To achieve this masterful effect, I finished my cast-on not when I'd achieved the necessary number of stitches, but when I was over that number and had worked the very last stitch of the colour sequence before it started all over again with the first cast-on stitch. 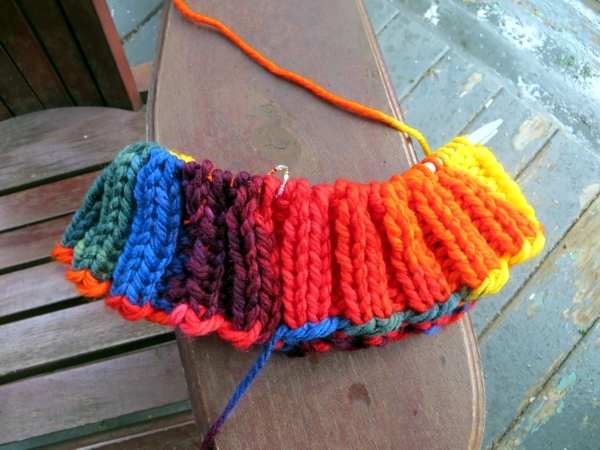 And then every time my next stitch isn't going to match the colour below it, I either knit (or purl) two together, or do a yarn over so it comes out right. I'm tolerating about a half stitch off-pattern, and that's it. After I took these pictures, Pete came within range of the vertically-striped knitting and I asked him whether he thought it was going to work or not. I mean, it's not going to come out the way I dreamed it would, but I did just spend $12 and about an hour to come to that conclusion, so I was hoping for a fresh perspective that makes this mess viable even if it's not what I was looking for originally. He hesitated for a really, really long time and then said "I don't know. It looks kind of bold." Then, while I was setting up the pictures later, he spotted the one of the variegated swatch and said "I like that! It looks like Lego." So: no further ahead really. In good news, you can pass your own judgement on its success or otherwise when it's done and serving its purpose (even if it does that only for long enough to have its picture taken), which should probably happen Friday. 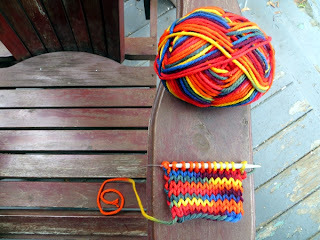 I'd hate to make you wonder longer than that what on earth I am doing with this crazy yarn. But I don't mind making you wonder a little, heh. Have a great day and I'll see you tomorrow! 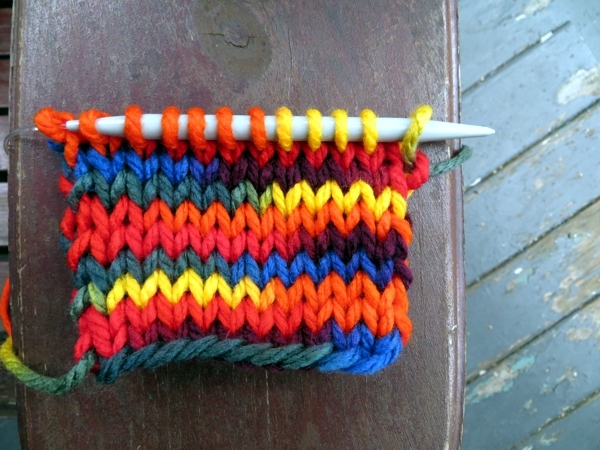 I love the stripes and never would've thought to knit it that way. I don't like the outcome of variegated but am often drawn to the color combinations. This makes it work! Thanks for the tip!! 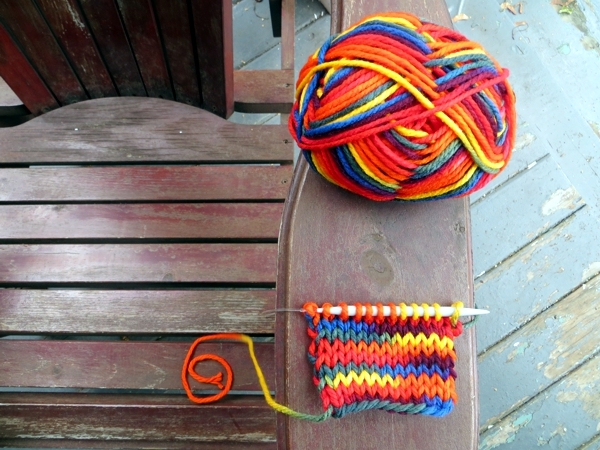 I love how you've decided to bend the errant yarn to your will ... what will happen when you get to the decreasing? I'm on pins and needles. Omigosh, decreasing! I didn't think of that... but luckily, there is no decreasing for this weird project. heh heh heh.